(Newser) – London police arrested 182 activists on bicycles who tried to breach the Olympic Park's security cordon during the Opening Ceremony, officials said today. Four people were charged with various offenses during Friday night's protest, while the rest were released pending further questioning, Scotland Yard said. 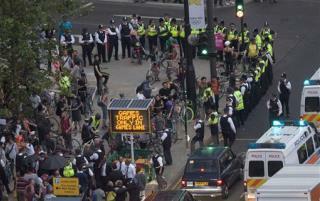 Police said that they were aware that a monthly protest by cyclists was planned for Friday, but ordered the protesters to remain south of the River Thames to keep them from blocking more than 80,000 ticket-holding guests. The story is missing what they were protesting against?